In 2000, a group of local residents gathered to discuss the condition and future of the small community park located at Reservoir Road and Wisconsin Avenue, NW behind the Georgetown Public Library. Once a charming and peaceful retreat, the historically significant park was now derelict. It was unsafe, sadly neglected, and overgrown. This group, founded by Ed Thomson and Julia Diaz-Asper, determined that the DC Department of Parks and Recreation was unable to maintain and restore the park and the grass roots effort was begun. 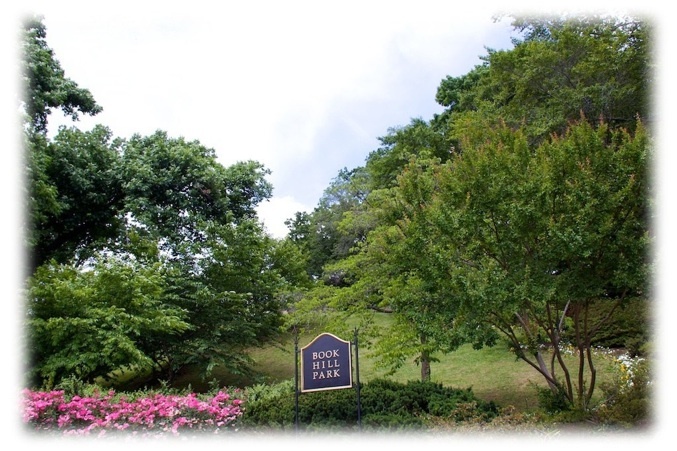 The Friends of Book Hill Park was organized as a tax-exempt corporation and the work began. They became the guardians and adopted the park. At first, the Friends thought that a hands-on approach was the answer. The volunteers pruned and pulled weeds, removing a great deal of plant material and rubbish in the process. This hard work allowed a clearer view of the park, which make it painfully obvious that outside help was a necessity. And that meant money. Lots of money. Professional bids were reviewed and fundraising began in the spring of 2001. Dead trees and shrubbery were removed and the park was pruned by professionals. Structural improvements include brick sidewalks and a new lawn at the top of the hill. Old benches were repaired and new ones installed. On-going funding is needed for the restoration of masonry and general maintenance. In 2004, Ed Thomson and his group were honored with the William Cochran Community Service Award by the Citizens Association of Georgetown (CAG). Around this time, our local merchants began to call themselves The Shops at Book Hill. They appreciated our efforts to enhance the neighborhood and decided to build on the work of the Friends. In April 2005, the DC Chapter of Colonial Dames of the Seventeenth Century placed a marker on the newly restored 1871 cast iron fence. Also in 2005, through the generosity of the Georgetown Garden Club and Outerbridge Horsey, a sign was erected at the foot of the staircase. This all-American event is fun for the whole family. Started in 2002, it has grown to include many area canines, who are judged for their good looks and talents as they parade down the park's grand staircase, led by Uncle Sam. Georgetown celebrities are encouraged to attend and bring their owners. This year’s Doggie Parade will be held on Sunday, June 28th at 8:00 a.m. Join the fun and experience the park!